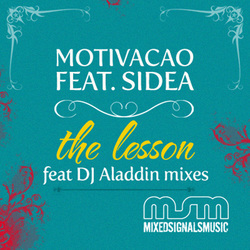 Motivacao Featuring Sidea "The Lesson"
Proper Soulful House MSM Style! For this round of MSM deepness, Motivacao team up with Canadian songstress Sidea. The result is Motivacao's 4th offering for Mixed Signals Music. The Lesson.. DJ Aladdin aka Souldub Quartet brilliantly takes this classic sounding rendition and flips it into two very musical yet different mixes. Aladdins' Soul'd out Mixes rely on a more dancefloor friendly sound whilst the Broken Dubs focus on more of a jazzy broken beat fusion.